T’Challa and Miles are both Oscar nominees today. After Oscar nominations come out, it’s easy to get lost in them. The snubs, the surprises, what’s in, what’s out...there’s a lot to digest. Because of that, sometimes you forget the sheer joy these nominations bring the people involved, whether it’s a personal nod or one for a project they were a part of. Let’s focus on that. 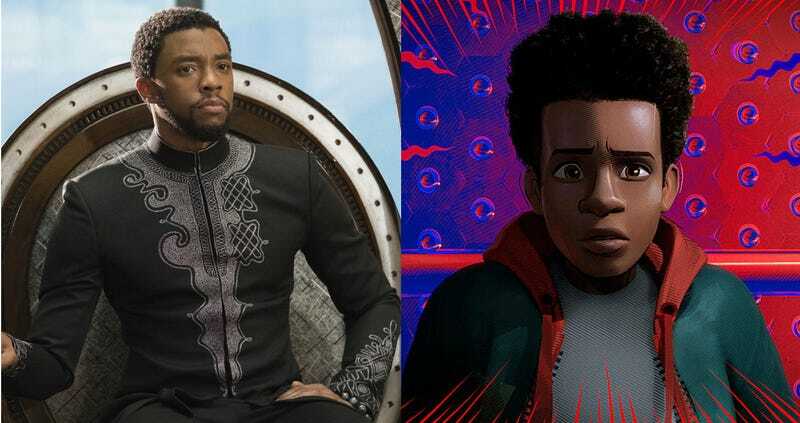 Below, we grabbed a few of our favorite social media reactions to today’s Oscar nominations (see the full list here), with a focus on the io9 genre movies. First up, a past Oscar winner congratulates her fellow cast and crew of one of the most-nominated films, Black Panther. And of course, our favorite movie of the year, Spider-Man: Into the Spider-Verse, got some love from its co-writer and co-director Rodney Rothman. Oh, spoilers. Here’s the head of visual effects for Solo: A Star Wars Story (and current head of ILM) Rob Bredow watching the nominations with his family. It’s awesome. One of the producers of Into the Spider-Verse gave the world this cool image. And though Richard E. Grant was not nominated for a genre movie (his Best Supporting Actor nod is for drama Can You Ever Forgive Me? ), he will next been seen in Star Wars: Episode IX, so check this out. Mary Poppins Returns probably deserved one or two more nominations but one of its co-stars was happy anyway. Somehow, Spike Lee’s Best Director nomination for BlacKkKlasman was his first ever. Crazy, right? Fellow filmmaker Jordan Peele was happy about that. Speaking of BlacKkKlansman, another Star Wars star got his first Oscar nomination because of that film. Here’s another one from Into the Spider-Verse nominee Chris Miller. But this is significant because he and Phil Lord famously left Solo: A Star Wars Story, and he still had this classy response for that movie. Here’s a weird one, from Martin Freeman’s brother, Jamie. Finally, a little self-congratulation never hurt anyone. Here are some official accounts patting themselves on the back—but rightfully so. Will these movies win? Find out February 24 when the Oscars air on ABC.